This document will provide you with general information on how to get, setup, and install the edonkey P2P (peer to peer) client. This document is intended as a general guide and will in no way provide specific advice for the end user. Upon seeing this image, you will click next. You will need to install only the required file. However if you like a link put in your quick launch and desktop, then select those options. 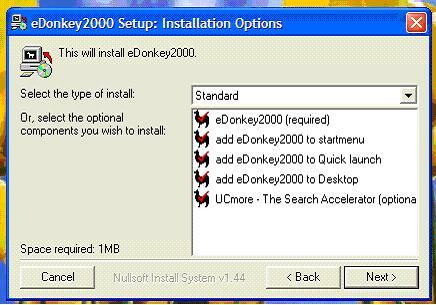 Further if you would like edonkey to run each time you start your computer then leave the check next to add eDonkey2000 to startmenu. I personally selected the first installation and unchecked the rest. I highly recommend NOT installing the UCmore option!!!! 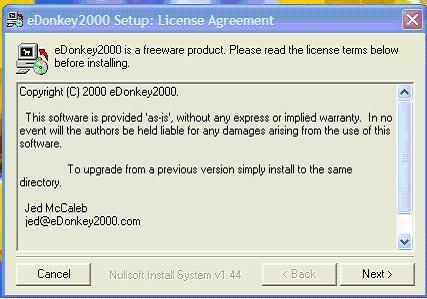 Upon selecting next you will be asked where you want to install the edonkey client. I leave it at default, as its easiest. You may however change it to suit your taste. Just remember where you moved the edonkey client if you change it. 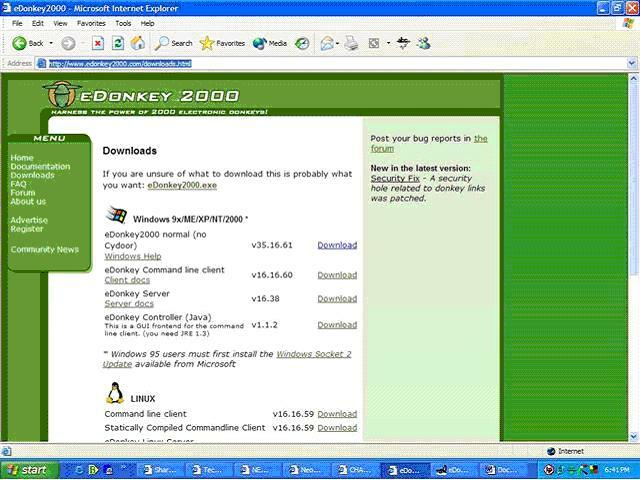 The first think you need to do once you have installed the edonkey client is to open it up and select the options tab. If you are behind a proxy, you can set up your proxy using the proxy settings tab. 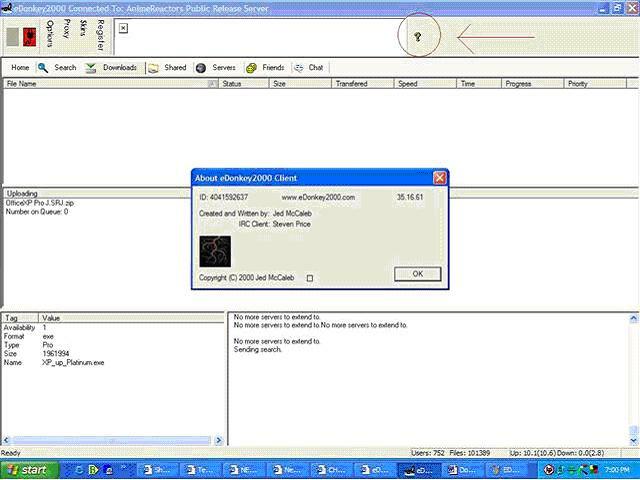 Contact your system administrator for the proxy setting information. Next I will address the EDONKEY ID system. You need to check your ID by selecting the YELLOW ? (question mark) next to the edonkey advertisement. 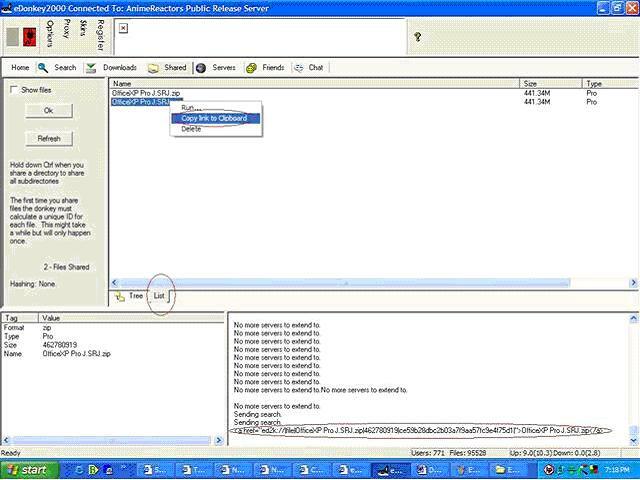 You need to make sure you ID is in the Millions or Billions, again this all depends on your IP address, and your setup. IF you are getting a low ID, this is more than likely related to a firewall issue, blocking the edonkey client ports. You need to allow the ports for edonkey complete access! So now you have a high Id, you have configured edonkey and you are ready to get some files! Well, this is the easiest part. There are basically two ways to get files on edonkey, one is to do a search and the second is to download a link to edonkey files from any site that supports edonkey links. Simply navigate or go to the tab within edonkey and select SEARCH. Then underneath the search tab you will see the word search for and a white box. Type in the name of the file you are looking for and then hit submit. 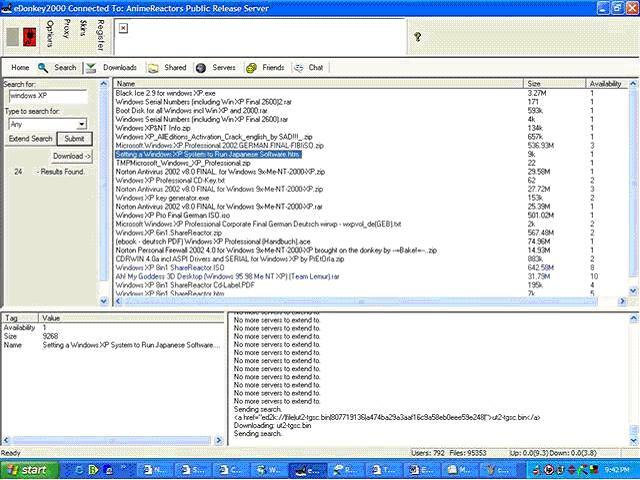 As you can see there are several files available for XP, but what is that you say, 24 is not enough, well this is where EXTEND SEARCH located to the left of SUBMIT comes into play. Just click your mouse over the EXTEND SEARCH BUTTON, and then leave the cursor over the top of the botton and hit, and hold enter. It will eventually exhaust the server list, and you will find many more files. You will also see a white box below the files you searched for. This will give you information pertaining to your downloads, links, servers, etc The other box with the words tag and value, give you information about the specific file you want to download once you highlight one and decide to download it. So now you are downloading and you are wondering how to share files. Go to the shared tab, and then select the directory you would like to share. Remember if you select and entire directory all of the contents of that directory will be shared on the edonkey network. If you want to share a single folder, just click on the + symbol and navigate to the folder or file you want to share. Then click the REFRESH button located to the left. So you want to link a file specifically that you are sharing. The easiest way to do this is to find your file within your shared folders, you will need to select the LIST TAB LOCATED beneath the shared folders and drives box. . Then right click and select send a copy to the clipboard. Once you have the link in the clipboard, you need to scroll select it, and the hit the CONTROL+C key! This will copy that link, and you can then paste it into the site or area where you would like to add it. You can also use these links in an internet explorer window. Just copy it into the address bar and hit enter. It will open up edonkey, if its not already opened and it will add the file to your download list, that is if its not already been downloaded. ABOVE IS A TYPICAL EDONKEY LINK. The above link is for Maurices server list. Just scroll to the bottom of the page and select add all! Thats it. Edonkey will open up and then you have about a 1-5 minute wait for the servers to update on edonkey. The above link will take you to the edonkey forums where you can get some great information on updating server lists. I recommend you all to visit the edonkey forums for help or assistance. This will help you as it has helped me in my battle with edonkey. COLORS: When you download files you will see a color coded bar. IT will range in color from Red, black and blue, with varying shades in between. What do these colors mean? BLUE, varying shades, the file is available, the darker the better. BLACK, part of the file you have already downloaded. Q: What does it mean when a download says "Hashing"? A: The donkey must insure that the partial file is the same as when you last used the donkey. The download will stay in this state when you first start and eventually switch to "Looking". Hashing is the process of giving a file a unique ID. It looks at every byte of the file so can take a while if the file is large. Q: What does it mean when a download says "insufficient disk space"? A: Since downloads don't necessarily come from start to finish there needs to be enough space available for the donkey to write to any part of the file. So the donkey checks each active download to make sure you have enough space to grow the file to its final size. You must have enough space free on both the partion of the temp directory and the partion of the incoming directory. If an active download changes to inactive (Paused, or Insufficient disk space) its ungrown disk space is no longer reserved and other downloads that were previously in the "Insufficient disk space" state can now possibly start. If you want a particular file to download that is in the "Insufficient disk space" state you can either free up some disk space (It might take the donkey a minute to realize you've done this) or set the file you want to "High" priority and Pause another active download. Q: What ports does the donkey use? TCP port 4661 to connect to the server. UDP port 4665 to send messages to servers other then the one you are connected to. Q: How come bytes transferred is larger then the file size? A: When you download a file from more then one source the donkey asks each source for a separate piece of the file. If one source doesn't send the piece you asked for then, when that is the last piece left, the donkey will ask another source to send it. This can cause some bytes to be sent twice. Causing 'Transferred' to be larger then 'Size'. The problem is worse on slower connections and with popular files. But this doesn't mean the download is corrupted. It should be fine once the donkey finishes it. DO NOT MESS WITH THE TEMPORARY FILES IN THE EDONKEY TEMPORARY FOLDER. Anything I have left out can be asked and answered on the http://www.techzonez.com/forums site or the edonkey site. Feel free to PM any of the mods or admins at the techzonez site for support or assistance.